The Crescent is one of the most anticipated developments rising in the City of Winds, capitol of Azerbaijan and getaway to the region. 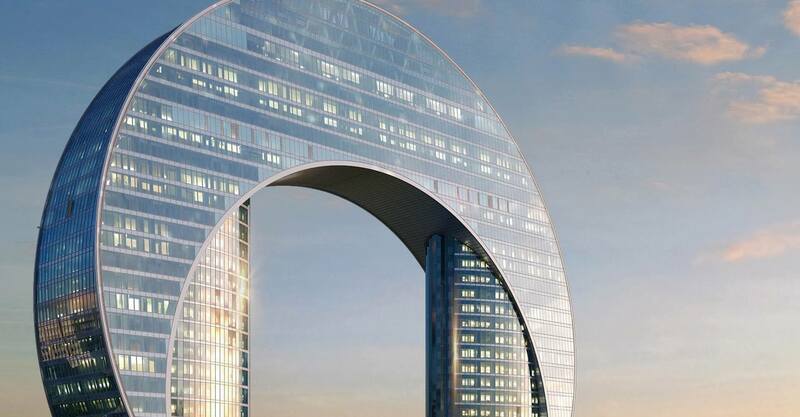 Mixed use mall and residential, it symbolizes a rising crescent moon over the shores of the Caspian Sea, will offer unbeatable panoramic views of both the open sea and Baku. Its curved sides, if for sure contribute to make this building unique, represent an exciting challenge for our engineers and designers. Floor by floor, the slope of the glass is changing, and so are the components of the reaction forces on the slab, the appearance of the glass, the safety requirements, amongst the others. Crescent project features different systems, ranging from unitized and stick curtain wall to metal cladding, combining a wide palette of materials including fiber cement cladding, timber laminate and expanded metal mesh. Koltay Facade BMU team designed a facade access system consisting of 2 machines on the roof, usually hidden and put in place with lifting platforms during maintenance sessions, and climbing monorails for accessing the two vertical central volumes of the building. Part of a redesign of the initial partly installed construction, scope ranged from site condition inspection through design to tender stage. KF is currently following up with construction supervision.